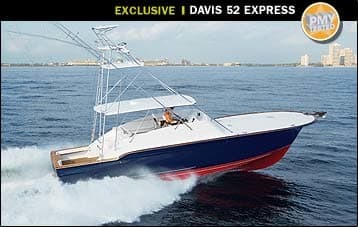 As we were getting ready to take the new Davis 52 Express out for some testing in the sporty Atlantic, Bob Weidhaas said something that knocked my socks off. 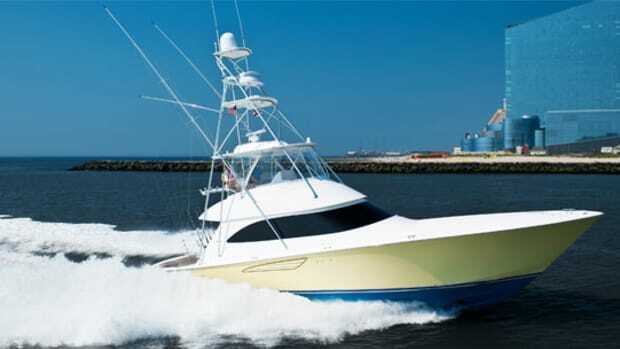 Weidhaas is the chief operating officer for Davis Yachts (as well as for Davis&apos; parent company, Egg Harbor Yachts), and he&apos;s a direct, no-nonsense kind of guy, especially when it comes to explaining exactly how his company designs and creates semicustom, Carolina-style sportfishing vessels. 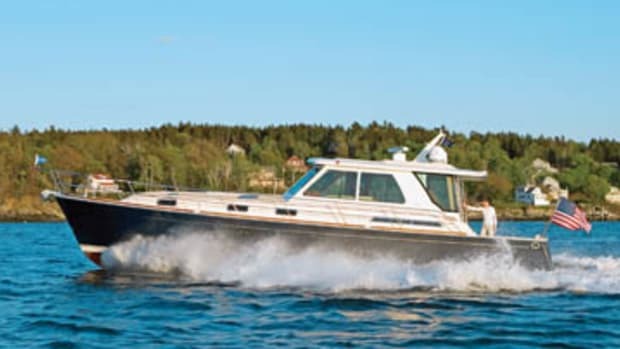 "We really don&apos;t consider how much stuff costs when we&apos;re putting one of these boats together," he said, just before firing up our test boat&apos;s big, seemingly smokeless MAN common-rail diesels. "We simply build the best product we possibly can, with the best materials, equipment, and technology, and then we sit down at the end of the day and figure out what we&apos;re gonna charge." Hyperbole is not exactly unheard of on boat tests, and I&apos;d have taken Weidhaas&apos; statement with the grain of salt I normally reserve for one of those boat-test semistretchers had I not just finished going through our 52 with him, stem to stern. It had been an impressive tour. Let&apos;s talk engine-room virtues first. There&apos;s no denying that the life the 52 was created to live and love is a tough one. 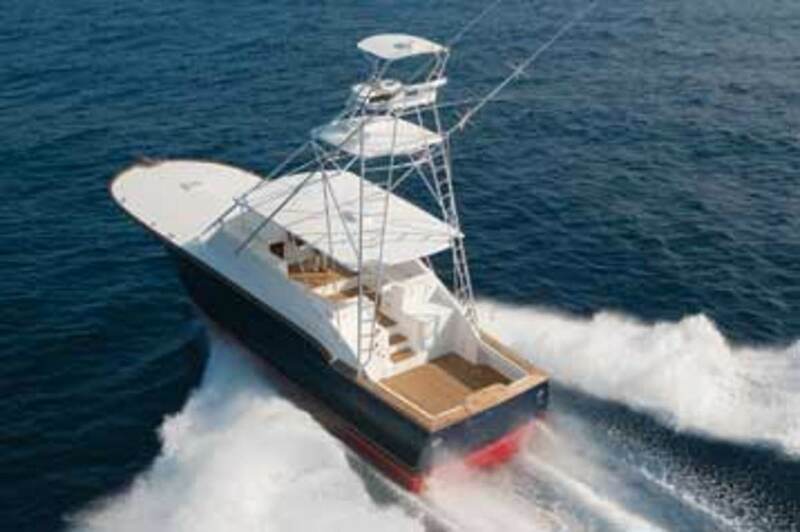 Offshore sportfishing is a demanding endeavor, often practiced under challenging and occasionally dangerous conditions. 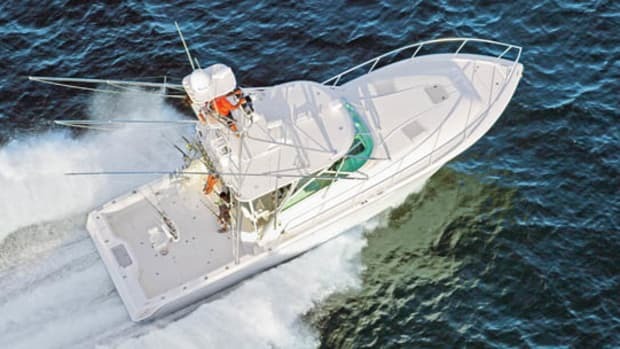 The folks at Egg Harbor understand all this, of course, most likely because they&apos;ve been building sportfishing boats in New Jersey since Old Tige was a pup. And most likely it&apos;s this understanding that&apos;s at the bottom of the salty, straightforward, safety-conscious approach the company takes when designing and equipping the 52&apos;s engine room. 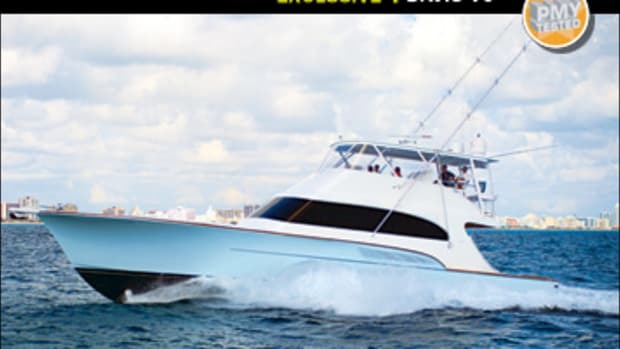 The good news starts with engine-room access: The 52&apos;s is different from what you&apos;ll find on most express-type sportfishing boats these days. Instead of getting to her mains and ancillaries by raising a heavy bridge deck via electro-hydraulic rams, you simply lift a large but comparatively lightweight hatch/step between the reefer and livewell consoles in the cockpit and step down into the ER, much as you would enter through the companionway entrance on a typical convertible. There&apos;s no arguing with the simple safety of this setup: Achieving fast, wide-open access to this engine room is not at all contingent upon electricity and/or hydraulics, and additionally, there&apos;s no thumb-twiddling while you wait for slow-ball actuators to actually actuate. 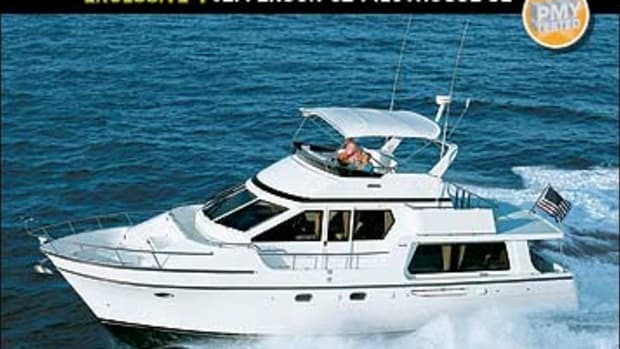 Solid design sensibility highlights the engine room itself. Thanks to a lofty headroom measurement that pushes seven feet, a plethora of D.C. and A.C. overhead lights, and white gelcoat, the ambiance is about as bright, open, clean, and schematically organized as an operating theater. Sea strainers, ball-valve-type through hulls, piping, and all other plumbing components are of stainless steel, an unusual feature in a recreational vessel, let alone one in the 50-foot range. Why expensive stainless? I asked Weidhass. "The stuff doesn&apos;t corrode like bronze," he explains. "And it looks better, long-term. Who wants to see green corrosion all over the place?" The air intakes are the product of the same don&apos;t-spare-the-hours mentality. 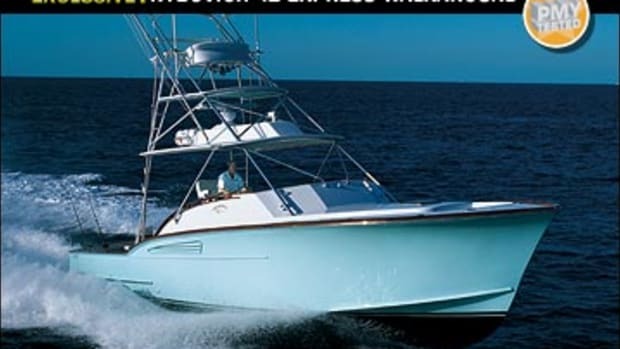 Long, louvered vents under the cockpit gunwales, port and starboard, pull air into the ER via big, beefy, industrial-grade marine fans, baffled fiberglass dorade boxes, and plenums with filters and screens outboard of the mains. The point is to interdict and drain all moisture from cockpit air that&apos;s already fairly dry and salt-free, at least by comparison with what&apos;s typically inhaled by vessels with hull-side vents exposed to the sea. 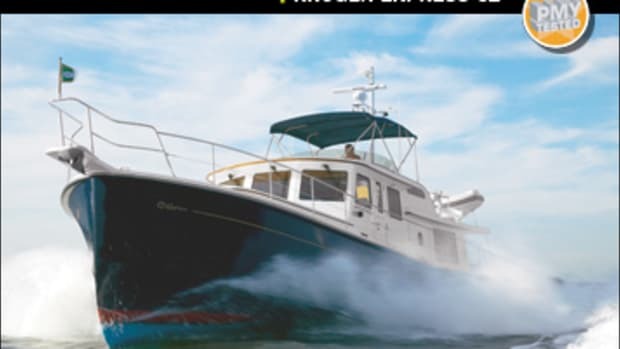 And finally, the same thinking that backgrounds great engine-room access, stainless steel valves, and superior air-intake design also figures heavily into the 52&apos;s big-time bilge-pump redundancy. In addition to the automatic Rules units (with Sure-Bail float-switches) that are so common in sportfishermen engine rooms these days, the 52&apos;s got an additional pair of engine-driven crash pumps—one per engine and each with a stainless steel gate valve and a heavily screened pickup. Why two pumps? If one engine quits during an emergency, explains Weidhaas, you still have a shot at getting the other to empty the engine room. Why gate valves? Because lever-type ball valves are too easy to inadvertently deploy, a move that can fry an engine. There&apos;s more to life than engine rooms, of course. And while the 52&apos;s conventional, two-head, two-stateroom layout is perhaps less impressive than her engine room&apos;s equipage and arrangement, her interior&apos;s got several unique, high-end features that are worth mentioning. Chief among these is the quality and finish of her joinerwork, most of it done in solid teak, all of it varnished to the nines. Next in line are her comfy fitments and furbishments: From Hand-Craft innerspring mattresses in the berths to Raritan Atlantis MSDs in the heads, everything&apos;s top-shelf goods. "Wanna go for a boat ride?" asked Weidhaas, once I&apos;d got my mind around his remarkable build-a-boat-first-then-figure-out-the-cost-later statement. I tossed off the bow lines, and he dealt with the stern. Things went smoothly enough. My job on the foredeck was facilitated by an Awlgripped nonslip surface underfoot—way safer than the mirror-smooth, highly cambered, slippery-when-wet foredecks of numerous other sportfishing vessels I&apos;ve tested over the years. We hit the trail for Miami&apos;s Government Cut to do speed and acceleration runs, preparatory to venturing into the Atlantic for a test drive. The spiffy 47.2-mph top speed I recorded was indicative of things to come. 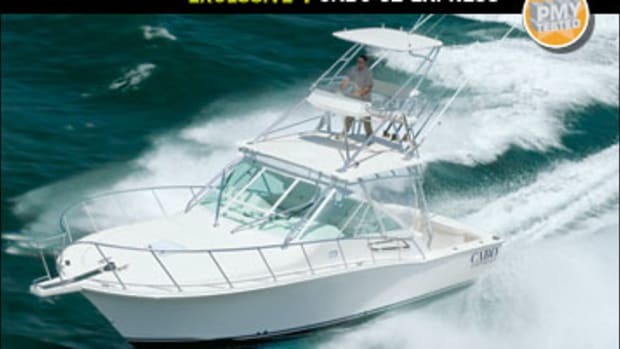 Moreover, thanks to a little extra elevation in the bridge deck and some comparatively lofty chrome pedestals on the Murray Brothers helm chair, visibility over the bow while we were zooming up and down the cut was excellent. And thanks to power-assisted hydraulics from Teleflex SeaStar, a stainless steel Release Marine wheel, and a set of Palm Beach-style engine controls (also from Release) on either side of the sweetly varnished control station, handling was excellent as well. The test drive was flat-out fabulous. Over the years I&apos;ve run several Davis boats designed by Nick Boksa, the naval architect who used to work for Buddy Davis himself but switched to Egg Harbor when Egg Harbor bought the Buddy Davis marque. Every one of these vessels evinced super-quick turns, rail-straight tracking down-sea, a dry ride going up-sea, and the sort of lithe agility that&apos;ll put a smile on just about anybody. The 52—a Boksa boat—ran like all the rest. 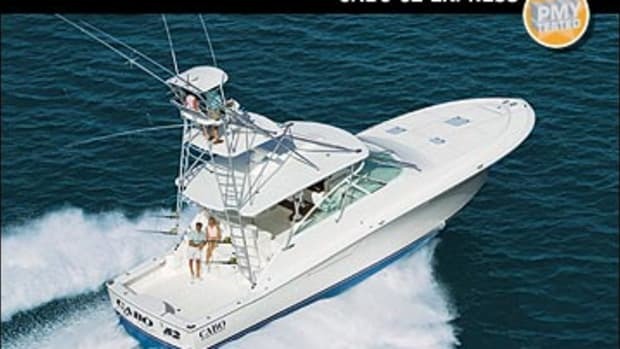 I greyhounded her around the Atlantic for at least an hour, in three- to four-foot seas, sometimes at full throttle, sometimes at two-thirds throttle, sometimes on one engine (top speed: 18.4 mph), enjoying every smooth, dry, fun-filled minute. Eventually, though, it got a little late and I had to "head for the barn," as they say. I wound the day up in characteristic fashion, sitting in one of the Murray Brothers ladder-backs with a notebook and an idle pen, thinking about what I&apos;d seen and experienced during the day. 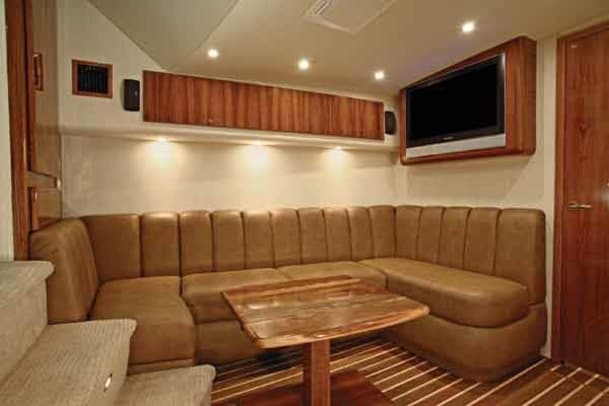 Certainly the interior of our test boat had a conventional layout and a decor that was as gorgeous as her broken-sheer, Carolina-flare styling. And certainly her open-water performance had been absolutely enjoyable and rousing. But what made the Davis 52 Express special for me was her engine room. Charge offshore in dicey conditions and all that solid, heavy-hittin&apos;, safety conscious stuff down there&apos;s gotcha covered. Big time!